The house I grew up in was full of art from the Canadian Arctic. From soapstone carvings to caribou tufting and Ted Harrison paintings, my parents had brought it with them when they moved south from their home in Yellowknife on the northern shores of Great Slave Lake in the Northwest Territories. But among all of this, it was a small model of a skin-on-frame kayak that captured my imagination. Qajaq, the Inuktitut root word for what we now spell kayak translates roughly to “hunter’s craft.” For thousands of years, these boats have been tools used by Indigenous Peoples in the Arctic as tools to pursue whales, seals and other prey across the frigid waters and coastlines of the Arctic. Long, fast and silent, kayaks today are primarily used as pleasure craft, but ever since a massive wave of water-borne protests took place last spring in the Pacific, they are fast becoming a symbol of a new kind of people power in the fight to stop runaway climate change. On April 17, 2015, Shell’s Polar Pioneer, a monolithic yellow and white drilling rig, arrived in Port Angeles, a small town on the tip of Washington’s Olympic Peninsula. Anchored beneath the Olympic Range, the rig had already drawn the ire of Seattle residents when they learned the city’s port had agreed to a lease with Royal Dutch Shell to allow the rig use of its facilities. By early May, the city council had turned against the oil giant. Just over a week before the rig was expected in Seattle, Mayor Ed Murray called on the port to secure a new land-use permit in order to host the rig. 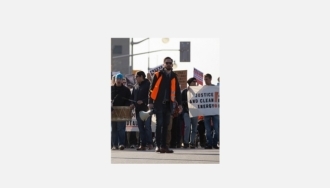 “This is an opportunity for the port and all of us to make a bold statement about how oil companies contribute to climate change, oil spills and other environmental disasters—and reject this short-term lease,” he told the media. The political manoeuvre was deft, but not enough to stop the rig, and so on May 14th, people took to the water. Confronted by First Nations and hundreds of kayaks, images from the action spread around the globe—small boats led by First Nations canoes in a David vs. Goliath struggle with a massive drilling rig bound for the melting arctic, the physical manifestation of misguided oil lust in the age of climate change. Actions continued for weeks, and spread while the Polar Pioneer remained in the Port of Seattle. In Bellingham, a short drive south of the Canadian border, a student activist chained herself to the anchor line of Shell’s Arctic Challengerand later in the summer, 13 activists in Portland rappelled from, while kayaks paddled beneath, the St. Johns Bridge in Portland, Oregon to block Shell’s icebreaker Fennica from joining the rest of the company’s drilling fleet in the Arctic. While Shell’s fleet was successful in reaching the Arctic, by September 2015, the company announced that it would be ending its plans to drill in the Alaskan Arctic for the “foreseeable future.” A month later, the Obama Administration made moves to limit future Arctic drilling in the Chukchi and Beaufort seas and rejected a request from Shell to extend its lease. These actions, colloquially known under the banner of #ShellNo, galvanized many people’s imagination by using small boats to confront a major injustice. This recent example of people power with a paddle can trace its roots much further back. In July 1971, police arrested seven people and intercepted two canoes attempting to blockade the Pakistani freighter Padma from docking at Port Covington on the middle branch of the Patapsco River in Baltimore harbour. The ship was loaded with weapons and bound for Pakistan where, a few months earlier, the military had launched Operation Searchlight, a military incursion into East Pakistan supported by the United States that was meant to quell rising Bengali nationalism. By the end of the operation, hundreds of thousands of civilians would be killed and millions of refugees would flee to India. A few days before the arrests, activists from Philadelphia arrived in Baltimore as the “Friends of East Bengal” and set out into harbour to begin their blockade. It would take a few days for the ship to arrive, but on July 14th the “non-violent fleet”—three kayaks, two canoes and rubber raft—paddled out to confront the ship. The activists were arrested, but in the weeks and months that followed, the fleet grew into a “non-violent navy,” continuing to blockade ships laden with arms in New York City, Boston and Philadelphia. The campaign also took off onshore, when the over 100,000-member-strong International Longshoremen’s Association refused to load arms onto ships bound for Pakistan. Later that same year, on September 15th, an old fishing boat set sail towards a small island called Amchitka, located off the west coast of Alaska. The boat was called The Greenpeace and its crew was determined to sail in and prevent the United States government from perfuming a nuclear weapons test. From those early days, to putting Zodiacs into the pathways of whaling ships, and more recent events like the dogging of an Arctic-bound drilling vessel that landed thirty activists in a Russian prison, Greenpeace has become nearly synonymous with high-stakes action on the high seas. With roots in both of these examples, and countless others, “kayaktivism” is one wave of a rising tide of mass climate disobedience and popular environmental direct action. A departure from the trends in the 1990s and early 2000s towards direct action becoming a campaign tactic carried out by small, highly specialized groups, today, they are returning to the traditions of past movements and being embraced as core strategies of a growing mass movement ready to go toe to toe with the fossil fuel industry. In April 2014, a group of Pacific Islanders called the Pacific Climate Warriorslaunched a bold pledge in Australia to take to the sea and blockade coal exports from the Newcastle Coal Port on the country’s eastern coast. And, they would do it using traditional canoes they would carve themselves. After months of work building momentum, and building canoes, they took to the water in October. 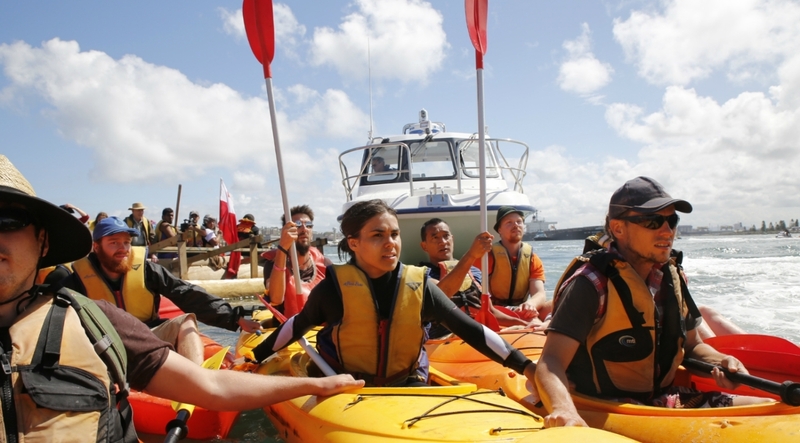 Thirty warriors from twelve islands were joined by hundreds of supporters on the water, where they blocked coal ships from leaving the world’s largest coal port. That’s why they adopted the slogan “We are not drowning. We are fighting,” and why their canoes were such a powerful tool. Much like the kayak in the north, these canoes have deep cultural roots, rich stories and a connection to the place that the Pacific Climate Warriors are fighting to defend. Taking to the water unlocked this connection, not just for the activists involved, but for people around the world with their own connections to the water. One of the Pacific Warriors, George Nacewa, summed it up in an interview:“We speak different languages and come from different cultures, but we are connected to the land and we are connected by the ocean.” This connection to water is at the heart of kayaktivism. On the surface, we take direct action and engage in civil disobedience around climate change for many reasons. For some, it’s about their children and grandchildren. For others, it’s about a special place. For much of the world, it’s about survival. What connects most though, is a desire to protect life—be it the life of a person, a place or an idea—and when you dive a little deeper, that life eventually connects back to water. This connection can come in many forms. A fracking operation can poison a community’s water source and rising seas can threaten entire nations. Drought and disappearing glaciers can displace whole communities, like in Bolivia where the nation’s second largest lake has dried up, leaving fishing boats upturned, landlocked and useless as people have fled. An oil spill can transform a lake, river or coastline into a toxic site in mere moments, or a tailings pond can seep into a pristine river for years with similar effect. What connects all of these, is a pathway from water to life, and through that our actions are connected from the glacier, to rivers and lakes, and all the way to the ocean. For many, the image of a tiny boat like a canoe or a kayak in the path of a much larger vessel invokes the archetype of David and Goliath. It’s an interesting parable to consider when you remember that David rejected armour and sword when offered it to go up against Goliath, instead choosing a sling and some stones from a nearby brook. He chose a tool of the people over the weapons of his opponent, and similarly, a kayak can prove a powerful tool, especially when employed by a mass movement. A single sea kayak can stretch nearly twenty feet. An oil tanker can be the size of a floating skyscraper. Looking at these two boats side by side, many would chortle at the ridiculous proposition that the tiny kayak could prove to be anything more than an annoyance, like a mosquito, to the tanker. While it’s true that one by one mosquitoes are easily swatted away, when they swarm they can drive even the hardiest people towards shelter. The same is true of small boats. One may be nuisance, a few can pose a challenge, but many can come together into something that can swarm around, get in the way of and overcome some of the biggest and most imposing implements of climate destruction. That’s why, this May, people power and paddle power are coming together in actions on both sides of the globe. On the Pacific Coasts of Canada and the United States, massive flotilla actions are planned around oil refineries in Washington State and a tar sands tanker terminal just outside of downtownVancouver, British Columbia. In the Midwestern and Eastern United States, similar actions are planned in Chicago, Illinois and Albany, New York. On the other side of the globe, boats are headed back on the water in Newcastle, Australia. All of the actions are part of a larger wave called Break Free from Fossil Fuels and represent a new era in the climate movement, one where, as Rueben George, a spokesperson for the Sacred Trust Initiative of the Tsleil-Waututh Nation recently said, “We’ll do whatever it takes” to protect people, water and the climate. Cameron Fenton is an organizer, paddler and writer based in Vancouver, BC. By day he works with the global climate change campaign 350.org.